Ashland University is home to two programs specifically designed to enrich the college experience for students of exceptional academic ability. The Ashland University Honors Program offers academically talented undergraduate students cross-disciplinary experiences, participation in an intellectual community devoted to discussion and dialogue and special projects and courses that challenge the mind. 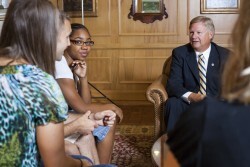 The Ashbrook Scholar Program was created to give exceptional students studying political science, history, pre-law, international relations or social studies education an immersion in the works of our greatest thinkers and statesmen along with access to well-known speakers who visit campus. Recent guests have included George Will, Colin Powell, George W. Bush and many others. Ashbrook Scholars receive a $2,000 scholarship that is renewable annually.